Given the fact that AWS now offers a bare metal service as another choice of EC2 instances, you are now able to deploy virtual machines based on HVM technologies, like KVM, without tackling the heavy performance overhead imposed by nesting virtualization. This condition enables you to leverage the highly scalable and available AWS public cloud infrastructure in order to deploy your own cloud platform based on full virtualization. The goal is to have a private cloud running KVM virtual machines, able to communicate to each other, the hosts, and the Internet, running on remote and/or local storage. I3.metal instances, besides being bare metal, have a very high compute capacity. We can create a powerful private cloud with a small number of these instances roleplaying worker nodes. Since OpenNebula is a very lightweight cloud management platform, and the control plane doesn’t require virtualization extensions, you can deploy it on a regular HVM EC2 instance. You could also deploy it as a virtual instance using a hypervisor running on an i3.metal instance, but this approach adds extra complexity to the network. We can leverage the i3.metal high bandwidth and fast storage in order to have a local-backed storage for our image datastore. However, having a shared NAS-like datastore would be more productive. Although we can have a regular EC2 instance providing an NFS server, AWS provides a service specifically designed for this use case, the EFS. OpenNebula requires a service network, for the infrastructure components (frontend, nodes and storage) and instance networks for VMs to communicate. This guide will use Ubuntu 16.04 as base OS. AWS provides a network stack designed for EC2 instances. Since you don’t really control interconnection devices like the internet gateway, the routers or the switches. This model has conflicts with the networking required for OpenNebula VMs. EC2 Instances don’t get public IPv4 directly attached to their NICs. AWS internet gateway (an unmanaged device) has an internal record which maps pubic IPs to private IPs of the VPC subnet. 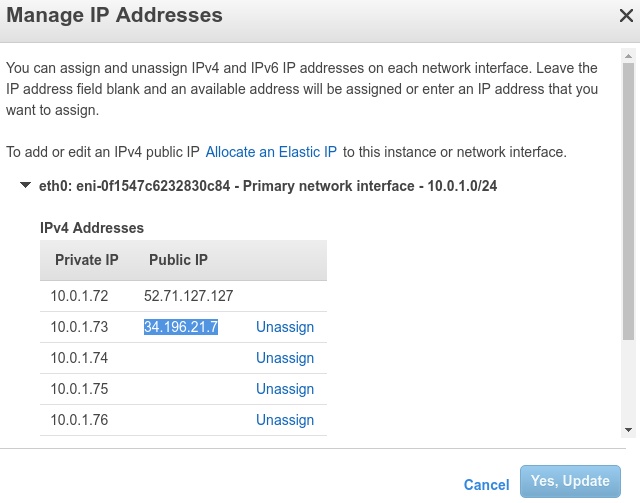 There is a limit of 5 Elastic IP addresses per region, although you can get more non-elastic public IPs. If you try to assign an IP of the VPC subnet to a VM, traffic won’t flow because AWS interconnection devices don’t know the IP has been assigned and there isn’t a MAC associated ot it. Even if it would has been assigned, it would had been bound to a specific MAC. This leaves out of the way the Linux Bridges and the 802.1Q is not an option, since you need to tag the switches, and you can’t do it. VXLAN relies on multicast in order to work, so it is not an option. Openvswitch suffers the same link and network layer restriction AWS imposes. OpenNebula can manage networks using the following technologies. In order to overcome AWS network limitations it is suitable to create an overlay network between the EC2 instances. 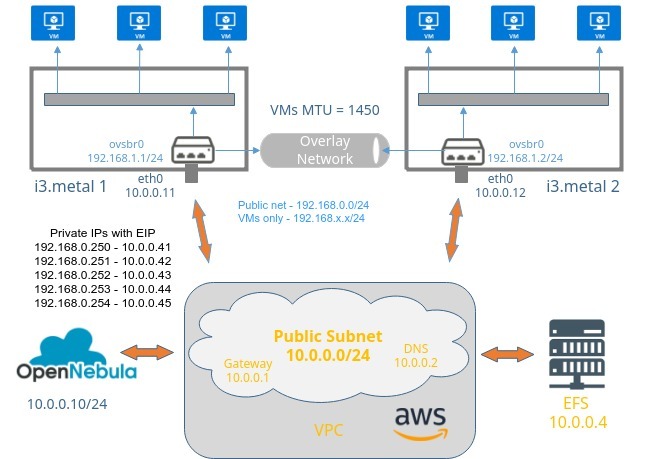 Overlay networks would be ideally created using the VXLAN drivers, however since multicast is disabled by AWS, we would need to modify the VXLAN driver code, in order to use single cast. A simpler alternative is to use a VXLAN tunnel with openvswitch. However, this lacks scalability since a tunnel works on two remote endpoints, and adding more endpoints breaks the networking. Nevertheless you can get a total of 144 cores and 1TB of RAM in terms of compute power. The network then results in the AWS network, for OpenNebula’s infrastructure and a network isolated from AWS encapsulated over the Transport layer, ignoring every AWS network issues you might have. It is required to lower the MTU of the guest interfaces to match the VXLAN overhead. In order to grant VMs Internet access, it is required to NAT their traffic in an EC2 instance with a public IP to its associated private IP. in order to masquerade the connection originated by the VMs. Thus, you need to set an IP belonging to the VM network the openvswitch switch device on an i3.metal, enablinInternet-VM intercommunicationg the EC2 instance as a router. You can disable public access to OpenNebula nodes (since they are only required to be accessible from frontend) and access them via the frontend, by assigning them the ubuntu user frontend public key or using sshuttle. This instance will act as a router for VMs running in OpenNebula. Choose an AMI with an OS supported by OpenNebula, in this case we will use Ubuntu 16.04. Choose an i3.metal instance, should be at the end of the list. Make sure your instances will run on the same VPC as the EFS. After installing the nodes and the frontend, remember to follow shared datastore setup in order to deploy VMs using the EFS. In this case you need to mount the filesystem exported by the EFS on the corresponding datastore id the same way you would with a regular NFS server. Take a look to EFS doc to get more information. Install opennebula node, follow KVM Node Installation. Follow openvswitch setup, don’t add the physical network interface to the openvswitch. You will create an overlay network for VMs in a node to communicate with VMs in the other node using a VXLAN tunnel with openvswitch endpoints. Create an openvswitch-switch. This configuration will persist across power cycles. Create the VXLAN tunnel. The remote endpoint will be one-1 private ip address. This is one-0 configuration, repeat the configuration above in one-1 changing the remote endpoint to one-0. Set the network configuration for the bridge. Set one-0 as a NAT gateway for VMs in the overlay network to access the Internet. Make sure you SNAT to a private IP with an associated public IP. For the NAT network. Write the mappings for the public visibility in both one-0 and one-1 instance. Make sure you save your iptables rules in order to make them persist across reboots. Also, check /proc/sys/net/ipv4/ip_forward is set to 1, opennebula-node package should have done that. You need to create openvswitch networks with the guest MTU set to 1450. Set the bridge to the bridge with the VXLAN tunnel, in this case, ovsbr0. For the public net you can define a network with the address range limited to the IPs with DNATs and another network (SNAT only) in a non-overlapping address range or in an address range containing the DNAT IPs in the reserved list. The gateway should be the i3.metal node with the overlay network IP assigned to the openvswitch switch. You can also set the DNS to the AWS provided DNS in the VPC. Testing the Scenario BRIDGE = "ovsbr0"
You can import a virtual appliance from the marketplace to make the tests. This should work flawlessly since it only requires a regular frontend with internet access. Refer to the marketplace documentation. 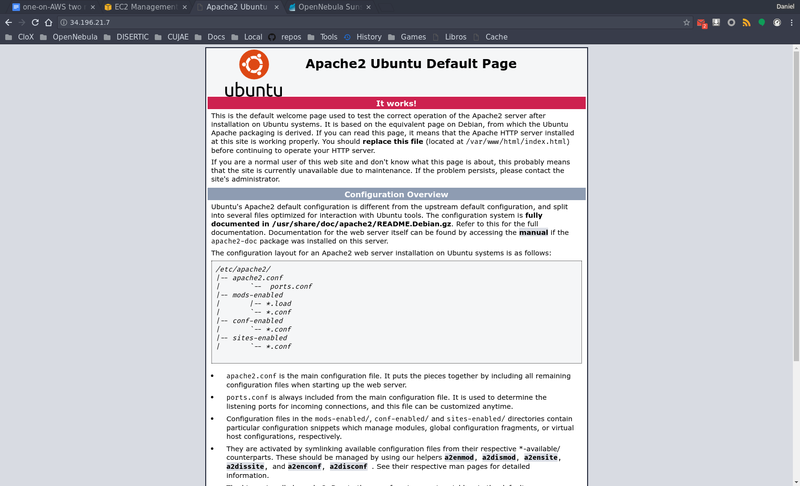 Install apache2 using the default OS repositories and view the default index.html file when accessing the corresponding public IP port 80 from our workstation. Then access the port 80 of the public IP. Just enter the IP address in the browser. Just a quick reminder, since OpenNebula EDGE now supports LXD you can apply the ideas exposed here to a cheaper infrastructure by using HVM EC2 instances since containers don’t require virtualization extensions. This will allow you to avoid incurring in the notably expensive fee of the i3.metal instances. OpenNebulaConf 2018: Agenda Available OpenNebula 5.6 ‘Blue Flash’ is Out!